The Mac 512K was a technological marvel in its day, but if you have one today you may find it frustratingly limited. It can only read 400K floppies (which can't be created from modern hardware) and it has no internal hard drive. It doesn't have an Ethernet port, nor an expansion slot to add one. Fortunately, there is a way to connect the Mac 512K, 512Ke, and other classic Macs via AppleShare to a modern network file server. This gives the old Macs access to a virtually unlimited library of software. If your Macintosh has Ethernet, you may want to skip to setting up the Linux netatalk server. Although it says "installer", this is a bootable System 3.3 floppy with AppleShare client functionality. You might be able to make your own 400K MFS floppy using an old Mac and Disk Copy 4.2. I lacked a suitably old Mac, so found someone on eBay that could make the disk for me. NOTE: This floppy is only required for the Mac 512K; most other classic Macs have AppleShare included with their System Software / Mac OS installation. The Mac 512Ke can use this floppy, or it can use an 800K System 6.0.8 boot floppy that includes AppleShare 2.0.2. This terminator comes with most PhoneNet adapters. Make sure all 4 pins are connected straight-through. 6-pin wire also should work. The Farallon EtherMac iPrint Adapter works perfectly for bridging AppleShare from LocalTalk to Ethernet. Most Linux distributions include some version of Netatalk in their package management, but you specifically need Netatalk 2.2.3 with DDP (EtherTalk) support enabled. I've also heard that Netatalk 2.1.6 works, so try that if you have issues with 2.2.3. NOTE: As of 2019, Slackware now installs netatalk 3.1, which is not compatible with older Macs. If you have netatalk 2.2.3 installed in Slackware, I recommend adding netatalk to /etc/slackpkg/blacklist to avoid updating to version 3. Connect the PhoneNet adapter's DB9 end to the Mac 512K printer port. NOTE: System 3.3 does not look for LocalTalk on the modem port! Insert the RJ11 terminator into one of the PhoneNet adapter's ports. 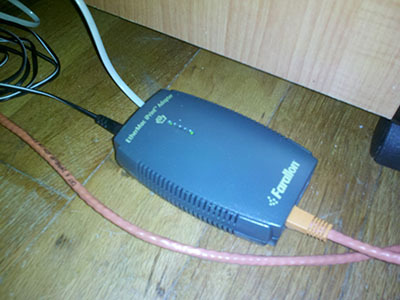 Connect the RJ11 4-pin cable from the other PhoneNet port to the LocalTalk to Ethernet bridge. 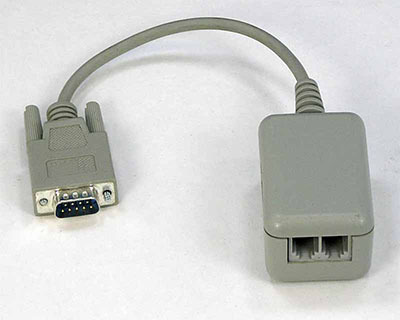 Connect an Ethernet patch cable from the LocalTalk to Ethernet bridge to your LAN switch. NOTE: If you don't use a switch/hub, you'll need a cross-over Ethernet cable between the bridge and your server. 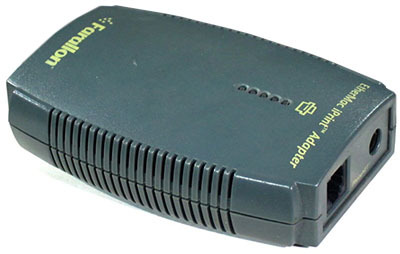 Connect the power adapter to the LocalTalk to Ethernet bridge. Everything you need to configure is under /etc/netatalk. You'll need root permission to edit these files. 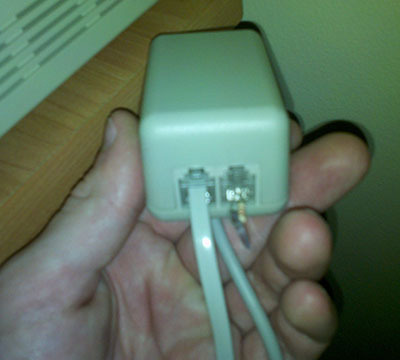 This file defines parameters for AppleTalk-over-Ethernet (EtherTalk). It should just be a bunch of comments by default. You shouldn't need to mess with these settings manually. NOTE: If you use a bridge, make sure it exists before rc.atalk is started; otherwise, this will reset to eth0. This file defines which transports to use for AFP. Like atalkd.conf, it's the last line that counts. The leading dash simply means use the hostname defined in netatalk.conf. We want to use both AppleShare IP (for modern Macs) and EtherTalk (for the bridge to the Mac 512K), so we specify -transall to enable both transports. For TCP/IP access, you may need to use -ipaddr to specify which IP address to listen from; put the Linux server's LAN IP here. You could optionally specify user authentication modules here, but we'll do it in netatalk.conf instead. This is the big configuration file for Netatalk. You'll want to set a few things here. Then we specify our shared folders. If you want to write files from the 512K, set volsizelimit:63 to limit each share to 63MB, because Netatalk seems to incorrectly report volume sizes larger than 63MB to System 6 and older; your Mac 512K will show "0K available" and treat the volume as full. NOTE: If you want a larger volume to write to from System 7 on a newer Mac, try volsizelimit:2047 (<2GB). Make sure your hardware is all connected prior to booting the Mac 512K. The LocalTalk to Ethernet bridge must be powered up before the Mac. Move the plastic tab on the AppleShare Workstation 1.1 floppy to the read/write position (cover the hole). System 3.3 cannot activate AppleShare without writing to the System Folder. Boot the Mac 512K from the AppleShare Workstation 1.1 floppy disk. Select the Chooser from the Apple menu. Click AppleShare on the left, and allow it to turn AppleTalk on if it is not already. Select your Linux server from the list, type your Linux username into the box, and click OK. It will ask you for a username and password; again use your Linux username and enter the password for it. NOTE: It should say "plaintext" next to the password box, indicating the use of uams_passwd.so on the Netatalk server. If it says "scrambled" next to the password box and your login fails, make sure you're not using uams_randnum.so in netatalk.conf or afpd.conf. Select a volume to mount and click OK. In my experience, you cannot use the checkboxes to automatically mount volumes at startup; it will give an error about AppleShare Prep if you try. All volumes will show 0K in disk, but that's not actually true. They will report the volume's maximum size as the available space, unless the volume is 64MB or larger, in which case it will report 0K available.